26 practical tool features have been packed in BitzBlade 2.0 EDC multi-tool, which help you deal with various tasks in your daily life. Sounds cool? Let’s continue checking. The BitzBlade 2.0 is a powerful and versatile EDC multi-tool that measures 5.3 inches long by 0.6 inches diameter and weighs 2.2 oz. As shown in the images, the multitool sports an ultra compact and low-profile appearance design, and the pen-shaped form factor and texturized exterior let you comfortably hold the multi-tool for various tasks. 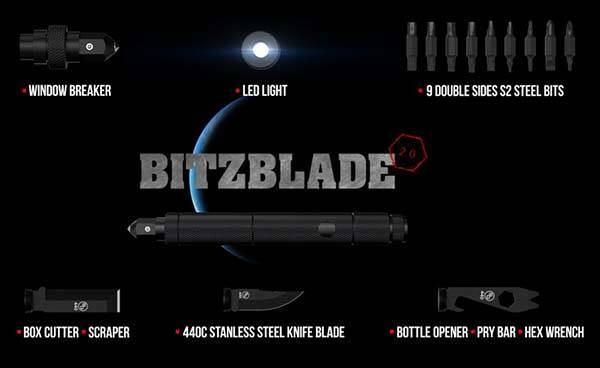 Meanwhile, the BitzBlade 2.0 is made from stainless steel for a solid, long-lasting construction. The EDC multi-tool features 3 main interchangeable parts including a box cutter, a knife blade and a pry bar with integrated hex wrench and bottle opener. 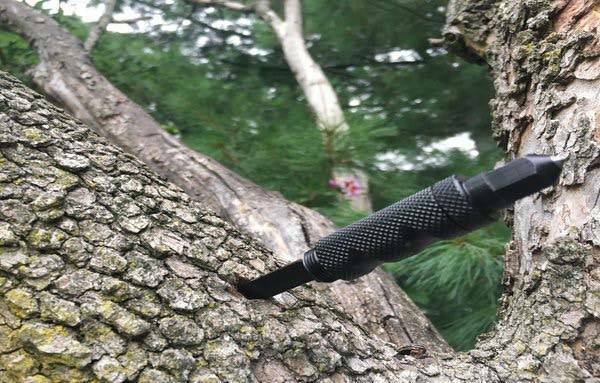 A solid window breaker can be attached at the end of the stainless steel multitool pen for an auto emergency, and a tiny LED flashlight is designed to provide emergent illumination. Moreover, its detachable screwdriver part comes with 9 interchangeable, double-sided S2 steel bits, so you will have 18 different drivers to use. In addition, an optional kydex carrying sheath keeps the multi-tool on your waist for easy access during any outdoor adventure. The team behind BitzBlade 2,0 has earned enough fund for the product on Kickstarter, but we can still pledge $55 to preorder the EDC multi-tool. It would be shipped in January next year.